Eco Garden Maintenance (Tadcaster) trim thousands of metres of hedge every year in the Leeds, York, Selby, Wetherby, Tadcaster and Sherburn in Elmet areas. 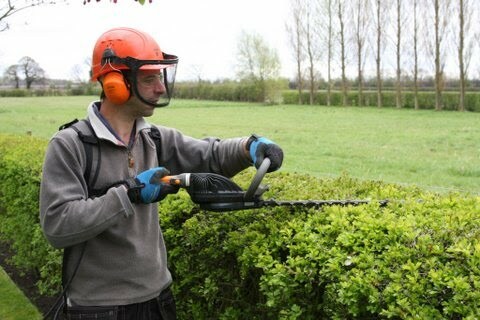 We are fully equipped to cut hedges of all sizes and species in a professional, effective and efficient manner. If you have nowhere to put the trimmings then don't worry, Eco Garden Maintenance can shred the arisings for use in your garden or remove them from site (we are registered waste carriers with the Environment Agency). Every hedge is different and needs to be maintained according to plant species, surroundings, situation and the clients requirements. Some hedges can be maintained to a good standard with one trim per year, but most require two and some three. Mixed hedges can be difficult to manage as the growth is much faster in some parts where there are particularly vigorous species. Formal hedges are usually made up of one plant and as such look much neater because of the even growth rate. Eco Garden Maintenance use Pellenc battery powered hedge trimmers which give an unsurpassed quality of cut on ornamental and utility hedges. Petrol powered hedgecutters are one of the loudest and most annoying garden machinery tools which are heard all over the country. The Pellenc battery powered trimmer is extremely quiet and does not project damaging, hot exhaust fumes into the hedge. Coniferous - some grow faster than others. Leylandii is a vigorous evergreen hedge and needs two trims per year. They can not be trimmed back into old wood as they will not regrow. Yew- although a conifer, yew is slow growing and can be cut back hard into old wood. Needs one or two trims per year. Evergreen. Hawthorn - needs two or three trims per year. Deciduous and can be hard pruned. Privet - a very formal, semi deciduous hedge that requires two or three trims per year. It is easy to produce a very neat hedge with this. Can be hard pruned. Laurel - a vigorous evergreen with large waxy leaves. This requires two trims per year but suffers from brown edges on the leaves when cut with a hedge trimmer. Can be hard pruned. Beech & Hornbeam - deciduous hedges which keep their leaves over winter if trimmed regularly. Needs one or two trims per year and can be hard pruned. Holly - a slow growing evergreen with spiky leaves. Requires trimming once in late summer and can be hard pruned. Lavender - a small evergreen which requires one trim immediately after flowering. It does not like to be cut back too hard although some success can be achieved if there are growing points lower down the stems. Box - a small evergreen which needs two trims per year and responds well to hard pruning. This list covers most of the popular hedge types but there are others. Special consideration should be given to flowering hedges and ones which produce berries. If the flowers and berries are important then we prune at the optimum time to maximise the production of these. Sometimes hedges are left to do their own thing, often out growing the space intended for them. The species making up a hedge are mainly trees and shrubs and as such want to grow to their mature height. This will happen if they are not trimmed, although when planted closely together as a hedge they will not get quite as big as a single specimen planted in free space with no competition. Eco Garden Maintenance are often employed to severely reduce overgrown hedges when they are so wide as to take up valuable garden space and are high enough to block out the sun for both the hedge owner and their neighbours. When the hedge has stems too wide for a hedge cutter we use Pellenc battery powered chainsaws and powered pruners which are extremely efficient and quiet. Nearly all hedges can be severely reduced in height and width but with most conifers there is limited scope for reducing the width as old wood will not produce any new growth. The best time of year for reducing hedges is in autumn and winter unless the particular species does not like to be pruned when the weather is cold. Hedges are popular nesting sites for our garden birds and so reducing hedges in the nesting season is a risky task to undertake. Eco Garden Maintenance prides itself in working with wildlife and the environment and so will not severely prune any hedges that contain nests or expose nests to the elements by cutting around them. We will always thoroughly check hedges for nests before agreeing to carry out any work. The wildlife and Countryside Act of 1981 states that is an offence to intentionally damage or destroy the nest of any wild bird while it is in use or being built. See this RSPB article for more details on the responsibility of property owners and contractors . Hedge reductions can produce considerable amounts of bulky waste which can be dealt with in a number of ways. If the property owner has space to pile the waste and then handle disposal themselves we are happy to enable this. The majority of clients do not have the space or the time to deal with such large amounts of green waste so Eco Garden Maintenance can shred the material and either leave for use on site or remove to a local composting centre.